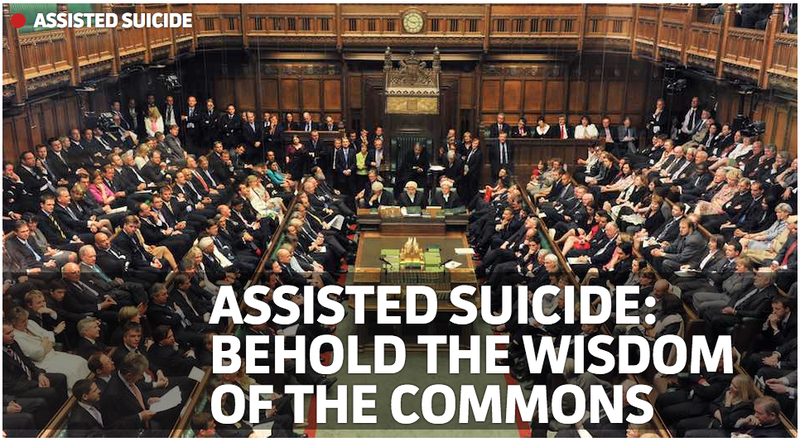 Spiked: Assisted suicide - Behold the wisdom of the Commons - No To Assisted Suicide - UK's campaign to stop assisted suicide. 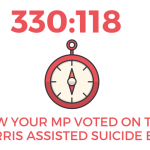 The debate on the Assisted Dying Bill showed parliament at its finest. As I attempted to get into the public gallery at the House of Commons last Friday afternoon, I heard a huge cheer from the other side of the road. It came from a collection of disabled activists, pro-life groups, religious charities, hospice workers and interested parties demonstrating against the Assisted Dying Bill. They had clearly heard the news: parliament had rejected plans to legalise assisted suicide by an astonishing 330 to 118 votes. It was certainly a surprise to many. 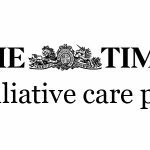 The Assisted Dying Bill had the support of powerful and influential people, including former director of public prosecutions Sir Keir Starmer, former Archbishop of Canterbury Lord Carey, the Sun, plus assorted celebrities. It was also claimed that over 80 per cent of the public supported the legalisation of assisted suicide. Yet the bill was still resoundingly defeated.